The one thing that I still miss about the farm is the silent snowy mornings. Moving to town has its advantages in snowy weather… streets get cleared a lot faster and the grocery is a lot closer but something is just not the same, let me explain. My horses in the top pasture on a snowy morning. When you own livestock you never get a snow day. So the mornings for me always started early even in the cold. I would get up early, like all farm families do, so I could get the feeding done before work and school would take the day. Dressed in my coveralls, hat, and gloves, I head out of the back door of the farm-house. I cross the back porch and hear the first crunch of the snow on a step. Walking my way to the barn across the yard I look for them but can not see them in the top pasture. Even though the barn doors are always open the herd of four quarter horse were never in the barn until feeding time. Even if they heard me tracking slowly through the snow they never moved. They stand at the farthest point away from the barn on the top of the hill. I holler at the top of my lungs”Here Girls!” and get no response. Just the quite… no cars or trucks, no snow plows (sometimes for days), no other person for miles was outside on a 12 degree morning. I reluctantly fill the feed buckets with two heaping scoops of sweet-smelling grain. I Complain to myself about walking up the bank into the pasture to looking for them. You do it to make sure that everything is alright if they do not come in. Horses trapped in fences, cases of colic and babies born in the open all happen when humans are not looking. Today was not going to be one of those days. I open the gate with the frozen chain and hear it bang as I swing it through the snow and across the frozen ground and into the pasture. The hill blocks my view. No knickers or neigh for me to hear from the group, just my snow boots crunching up the slope to the orchard trees. Annabell in snow at the farm in Jane Lew,West Virginia. Past the orchard trees, I finally see the huddled mares in the upper corner of the field. Snow only ankle-deep and they still do not want to move. “Come on Girls!” I yell again, this is ridiculous I think as the wind blows the quiet snow in my eyes. I give in and walk to top of the hill and discover I am out of breath and breathing hard. The steam I blow matches the clouds that surrounds them. They breath in and out almost in time and the moisture from the four 800 pound bodies rises into the air. They see me and two heads turn as I finally come close enough to actually touch the snow-covered beasts. Their winter coats are such good insulation against the cold that snow flakes dance on top of the longest hairs of each animal. Icicles form on the whiskers of each damp muzzle and each wet eye lash. The mares do seem to mind the cold and seem more at home in the winter snow. Daisy with Skippy in the snow on the Jane Lew farm. For the small herd, standing and sleeping is more comfortable than slipping down the hill to the barn. I can’t blame them, they have stood together most of the night and have melted some of the snow on the ground . I sneak up close to the oldest mare and slide my gloved hand across her back and talk softly and she murmurs back to me. I get close and feel the warmth of her 100 degree body against me. Warmth and friendship, could life get better for her? The others push closer to me, nose to nose, they breathe me in and I, them. The smell of the mare’s breath and coats is warm, round and deep. 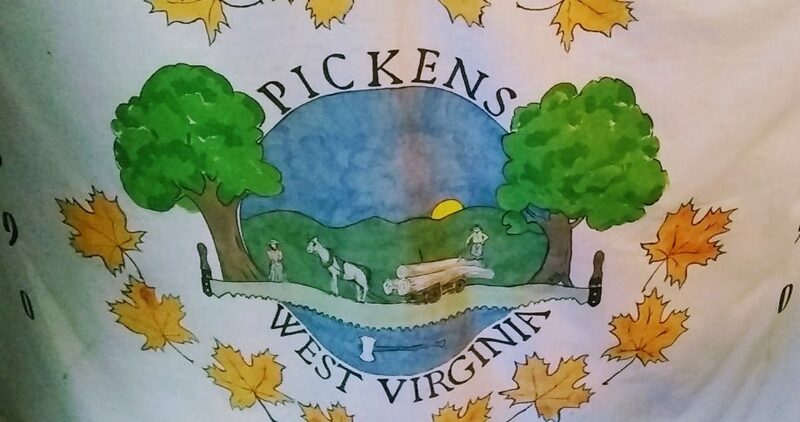 It is the smell of the summer dirt, fresh-cut hay and dark warm stalls.They smell of old barns and fresh shavings,of carrots and cookies, of sunshine and creek water. I kiss each nostril in turn. Hidden in my coat pocket is a lead rope that I slide around the old mare’s neck. I clip it under her chin… more imagination than rope. I lead her and she willingly follows me down. The younger horses gallop back and forth across the field, bounding, bouncing, jumping and twisting. Play time for the young and feed time for the old. I walk her through the gate to the barn, each following her lead without a fight. Her head lowers into the bucket and she blows out the air in her lungs as if to sigh. The rattle of those buckets is the only sound for miles. The sun rises to the shifting sounds in my barn. I toss hay into each stall as the last of the gain gets lipped out of old buckets. My chore is almost done. The water is thawed and waiting when they finish their meal. The gate is locked up tight. I am alone again in my walk back across the large yard. My cheeks are cold and frosty but my heart is warm. I think to myself…. “Love You Girls” as I hear the squeaky snow under my boot. 4 Tips to Avoid Getting Poison Ivy From a Girl Who Has It! 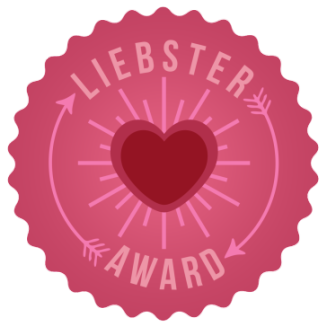 Ok lets just say that my husband told me so…. and I did it anyway. I have never really had a bad case of Poison Ivy up until this mothers day weekend. 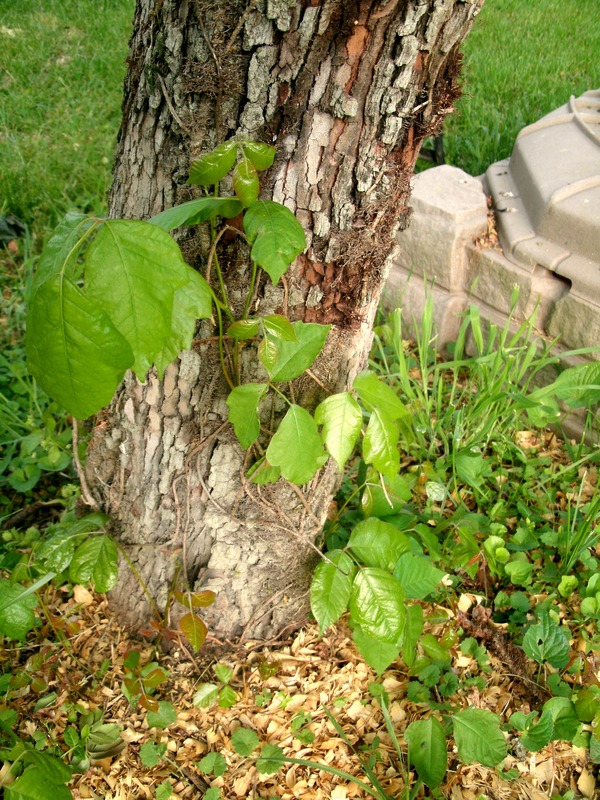 I wanted to clear away a vine that was clearly poison ivy off a tree we use as shade in the back yard. I wanted to put a sand box and pick-nick table under the Dogwood tree for the kids to play on. So without any thought I had Tom who gets terrible poison ivy to trim the vine off the tree and I would drag the pieces to the burn pile. I took no precautions other than a pair of gloves and that was my first mistake. I should have at least put on a long sleeve shirt, but no, I can handle this, I never get it, were my last comfortable words for a while. Now that I have an out break, and a pretty good one, I want to share some ideas on how to prevent getting Poison Ivy and Oak. The Appalachian Mountains are home to many poisons plants but the most terrible of all is Poison Ivy. Here are a couple of photos I took after removing the vine last week.We have tons of sprouts that still can cause problems and still need removed before the littl’ens can play safely under this tree. 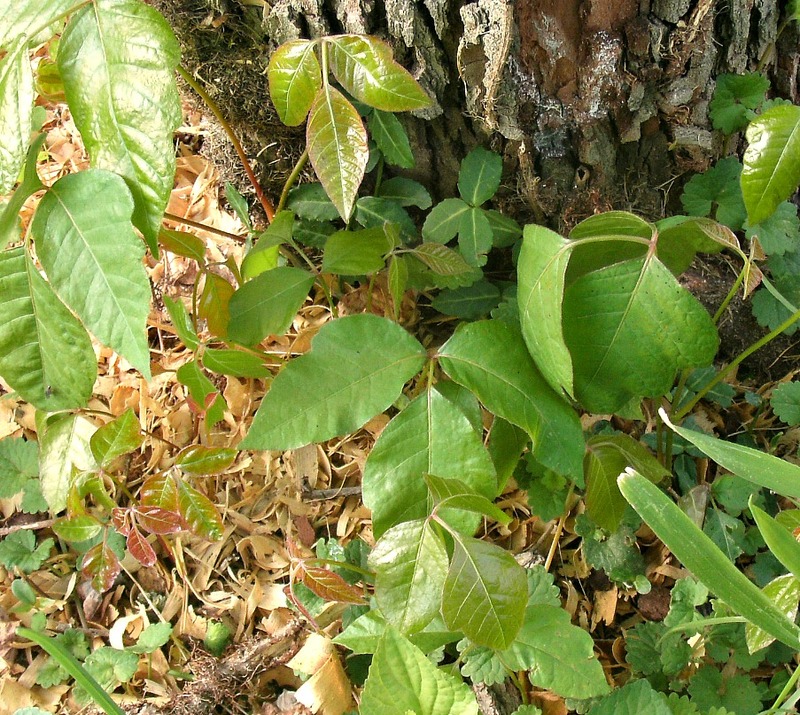 To identify Poison Ivy you will see three leaves in a group, usually the stems of the leaves grow red or pink. Each leaf that is mature in size has a notch on one side. In the case of these baby leaves they start red and slowly turn green. They have a vine stem of brown with what looks like brown hairs growing around the stem. This is actually the way the vine attach to things to climb. 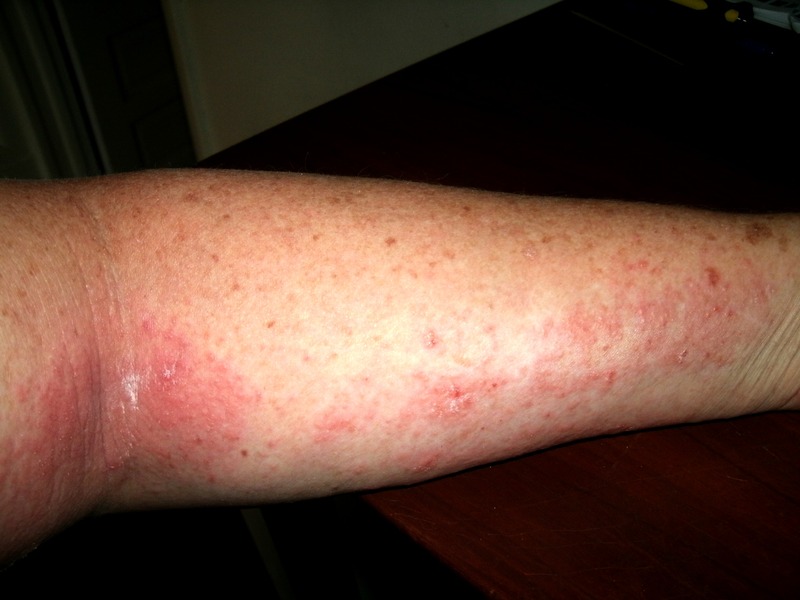 So now that you know that you have poison ivy how can you prepare yourself to deal with it. #1 First wear the correct clothing. Yes, I am sitting here wishing I had taken my advice. Long sleeves, long pants, gloves and shoes all need worn if you know you are going to battle this monster of a vine. Even the slightest touch from a leaf can lead to out break. #2 Use some of the pre-contact products out on the market both of which we have in our homes medicine cabinet and I still did not stop to think to use. First is the pre-contact towelettes. Simple easy to use and cheap they form a barrier on the skin to stop the plants oil from getting into contact with the skin. 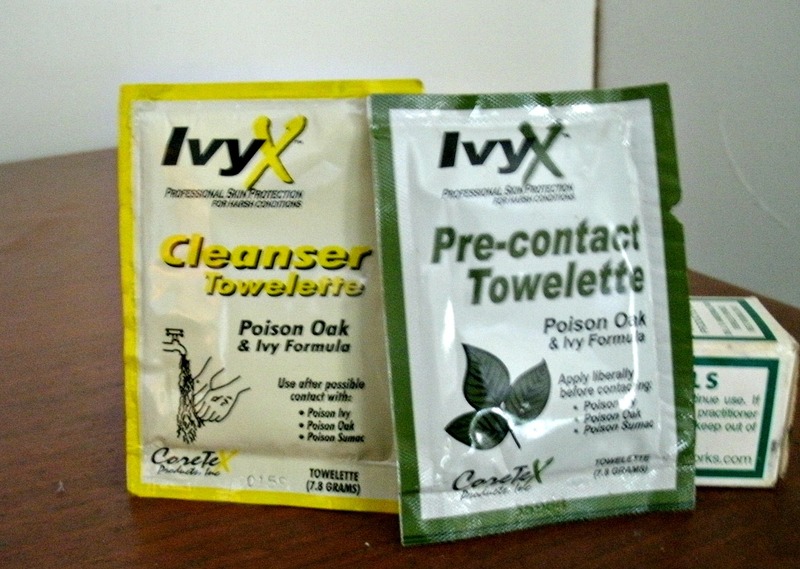 Then they also have a Ivy-X product to use after you get exposed and think the skin needs cleaned. My husband is always getting exposed to poison something and gets these at work. He works outdoors year round and cutting trees cleaning up under bridges is just part of the job.He uses these often with great results. #3 We also have what the family calls the secret weapon for poison ivy. It is a life saver for my husband and son who get terrible cases of poison ivy. 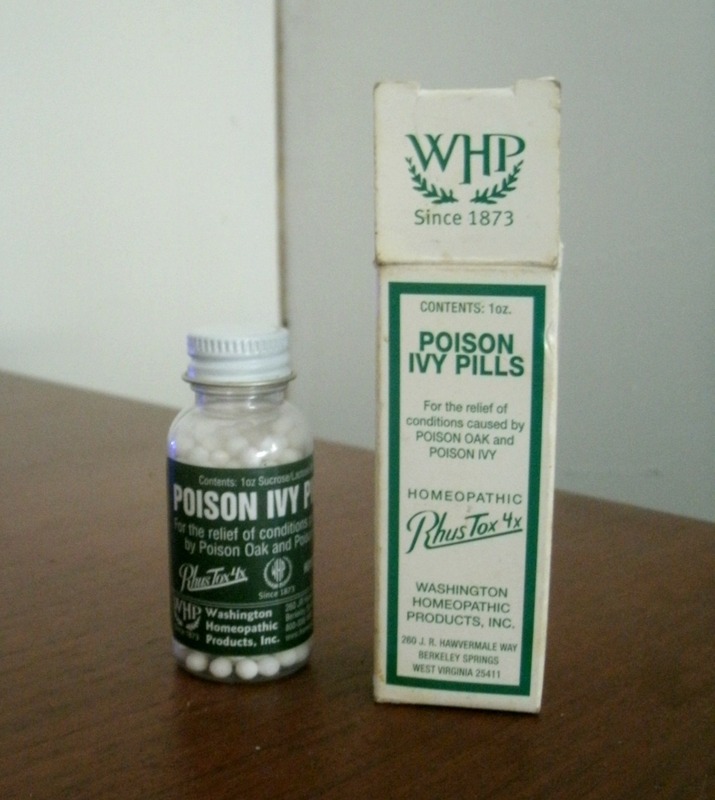 They use Poison Ivy Pills, a Homeopathic Remedy for pre-treatment and exposure to Poison Ivy and /or Oak. The pills contain a micro amount of the oil from the poison ivy plant and by taking very small doses of the aggravating oil your body has time to build up a resistance to it. I have friends and family who once exposed to the plant end up going to the hospital for shots of allergy medications.This little pill can prevent and or reduce the reaction to the oil that humans find so irritating. Each spring my husband and son usually take a preventative dose for the summer and a few again when exposure was possible. It seems to really help if you remember that you have some in the medicine cabinet. Which I did not remember until Tom reminded me and I took the starter dose of about 6 of the tiny pills over 6 hours. They are working to calm the pain, swelling and itching but I should have started earlier. #4 The best all a round way to reduce the reaction to poison ivy is washing off. With the use of a good dish soap(one for grease cutting) you can almost eliminate a break out altogether. I my case we were working out side for several hours and then got company and I just forgot until a few hours had already passed. I still washed off but the damage was already done. Then if all of these ideas fail you like they did me, use over the counter medications. I take a allergy medication already and it helps to reduce the itching but the rash needs specific treatments and there are lots of creams to use. I like Ivydry, it is a mixture of drying agents and soothing creams to help get you through Hell Week! So my friends spring has sprung and the Ivy is growing wild everywhere so take care not to end up like me and think ahead so you do not have to live with this rash for 14 days or more. Now I just have to get a gallon of vinegar and some hot water to kill the rest of those baby Ivy vines without having to touch them.